CORRECTION 2014-07-27: ID'd by William H. Taft on BugGuide as a male S. exitiosa, not S. fatifera, Arrowwood Borer, as I thought. A lifer for me. I never even knew such a thing existed. Synanthedon exitiosa, Peachtree Borer/Clearwing Moth, male, on Pycnanthemum muticum, Clustered Mountain Mint, in my garden yesterday afternoon. I was showing a visitor all the pollinator activity on the Pycnanthemum. I identified 8 different bee species in less than a minute. Then I saw ... THAT. In my peripheral vision I thought it might be a wasp from the general shape and glossiness. Once I focussed on it, I recognized it as a moth. How did I get "moth" from that?! Body shape: It doesn't have any narrowing along the body, which wasps and bees have. Eyes: Large round eyes on the sides of the head, unlike the "wraparounds" of bees and wasps. Antenna: They just looked "mothy" to me. It was nectaring on Pycnanthemum muticum, Clustered Mountain Mint, in my garden. This patch of Pycnanthemum is just a few feet from the large Viburnum dentatum, Arrowwood, in my garden. 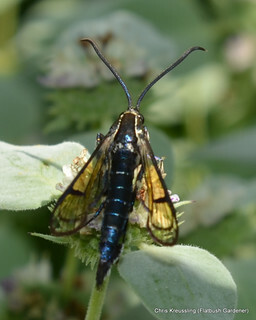 I've seen other Clearwing Moths, Sesiidae, so that gave me something to search on. The slender body was something I'd never seen before. Comparing with other images of Clearwing Moths, I was able to narrow it down to the genus Synanthedon. Then I used BugGuide and other authoritative sources to compare the coloration of the body and legs, and the markings on the wings, to key it out to species. 2014-07-24: But my original specific identification was incorrect! William H. Taft commented on one of my photos (the first in this blog post) on BugGuide that the amber color of the wings is a key to distinguishing S. exitiosa from S. fatifera. The BugGuide species page notes the yellow bands of "hairs" at the joints between the body segments. But the comparison species are other Peachtree Borers, not Arrowwood Borer, so I missed the comparison. Looking at other photos of male Peachtree Borers, they look more like my find than Arrowwood Borer. Markings on the wings appear to be variable, not as diagnostic as I'd assumed. This is a lesson for me to be more conservative in my identification, and rely more on diagnostic keys than naive visual comparisons. Oblique shot, showing the wing markings and venation. Another common name for this species is Arrowwood Borer. It seems likely that this adult either just emerged from my shrub, or was attracted to it. I'll look to see if I can find any borers still in the shrub.